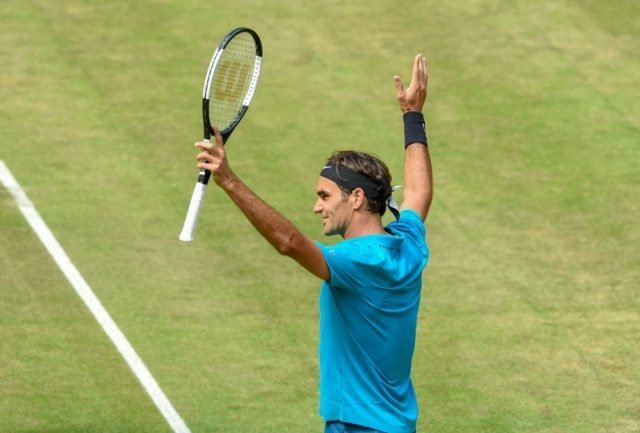 Halle Westfalen (Germany) (AFP) – Roger Federer stepped up his grass game as the start of Wimbledon looms, holding off Australian Matt Ebden 7-6 (7/2), 7-5 in their quarter-final at the ATP Hale tournament on Friday. With his world number one ranking on the line, the Swiss is sparing no effort to make sure he lifts a tenth title at the event on Sunday. Failure to win the grass title would send rival Rafael Nadal back to the top spot. Federer set up match point with a flicking backhand pass and then sealed his semi-final place as Ebden returned long. The victory was the 18th in a row on grass for the 36-year-old Federer, who last lost on his favourite surface in an opening match in Stuttgart a year ago, although the 20-time Grand Slam champion atoned last weekend, winning the Stuttgart tournament for the first time. Now Federer is having to work to win at Halle, the German replica venue which mimics the All England club, and then make his final preparation at Wimbledon itself before that tournament starts on July 2. Federer will next take on qualifier Denis Kudla, who scored the best grass victory of his career as he beat Japan’s Yuichi Sugita 6-2, 7-5. The American, ranked 109, had never been past a quarter-final on the lawns – which he achieved at Queen’s club, London five years ago. Kudla fired his sixth ace on match point to complete his victory in just under 90 minutes, as he broke his Japanese opponent four times.